HOW DO YOU PIGEON-HOLE a unique band like Marillion? Just when you think you've got it, you realise that the band is something else. Marillion's brilliant slow-burning style of rock-infused, folk-scented, country-flavoured and heavy metal-seasoned work is deliberately rebellious and refuses to slot into conventional genres  an inspired collection of poetry to music with a nod to traditional refrains. Marillion was one of the finest and biggest draws on the UK and European circuit during the period of these recordings. The albums released from 1982 to 1987  Script For A Jester's Tear, Fugazi, Misplaced Childhood, Clutching At Straws  sold hundreds of thousands of copies and featured many of the band's biggest singles. Everybody seems to remember the delightful hit Kayleigh  a memorable, well constructed, track with emotive words. But the bouncy, fun and compulsive singalong Market Square Heroes, with its folk-esque air, is another one of the great fan favourites along with the melodic, likeable epic Grendel. Garden Party, with its unusual delivery and distinctive opening melodies is worthy of note as is The Web, an emotional and punchy journey set to music that weaves a kind of magic. The latter's subject matter of depression and trying to makes decisions puts you in mind of the great Leonard Cohen as does He Knows You Know with its rare treatment of a serious song with serious lyrics. She Chameleon is a creditable track with enthusiastic vocals and terrific lyrics about someone standing on the edge of the spotlight. And how about mucking about on beaches in Brighton with Three Boats Down From The Candy? When it comes to controversial topics, Forgotten Sons is passionate and heartfelt and is about men fighting for their country. It is, says Marillion, a song for peace. The band has an assertive, darkish-Goth sound laced with surprisingly gentle melodies and admits it delves into the greyer side of life. The dialogue is amusing with the expected occasional F-word. Assassing is about various members leaving and about an elegant strategy involved in the business world. It is racy and indulgent and sits well among the tragic  like Chelsea Monday (about a girl who cannot face the prospect of failure to the point of being suicidal: "stringing all the pearls from her childhood dreams") and Script For A Jester's Tear, where a guy deliberately provokes the break-up of a relationship  and the very pretty, melodic and romantic Cinderella Search "for those in search of Angels". Daring to be different, Marillion treats you to the intriguing and mysterious Bittersuite, the darkly dramatic Incubus and the haunting melodies of The Pseudo-Silk Kimono with its shades of Swan Lake. Super-indulgent is Heart Of Lothian with its patriotic feel and rousing verses backed by swirling notes of misty Scotland; and Margaret  a musical excursion to the highlands, shot through with verses from Loch Lomond and Marie's Wedding. Marillion describes Fugazi as "a very European song for the poets, the prophets and the visionaries". The undulating notes and moody ambience of Hotel Hobbies is reminiscent of classic Jazz while That Time Of Night echoes with the weird, winding guitar work of a little night music. Stainte Athath is a neat and enjoyable number and The Last Straw is a very catchy, much more rock-inspired track with its waves of power. And if that's not enough to send you to your nearest CD stockist, then I don't know what is! 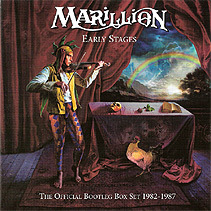 EMI is pleased to announce the release of Marillion Early Stages: The Official Bootleg Box Set 1982-1987 Limited Edition that brings together officially for the first time the much sought-after, previously unreleased live recordings that include concerts recorded for BBC Radio 1 and Radio Clyde.  This ultimate, Fish-era live anthology will be released on 17 November (2008) as a collection of unique (100% previously unreleased) material on a set of six CDs. The set will feature cover artwork from artist Mark Wilkinson, who designed the artwork for all the Fish-era Marillion albums. Each CD comes in its own individually-designed pouchette and they are housed in a clamshell box. A booklet is included and this will feature relevant memorabilia from each gig represented, along with an introductory note from Fish himself. A veritable treasure chest for all Marillion fans. (Catalogue No: BOOTBOX1). CD 1  Live At The Mayfair, Glasgow, 13 September, 1982 (Radio Clyde recording). A classic early concert recorded the week after the band had signed to EMI Records. Recorded for radio by Radio Clyde, the set features an early version of Fugazi album favourite She Chameleon, with different lyrics and arrangement. Storming renditions of first single Market Square Heroes and anti-war, future debut album track Forgotten Sons finish the seven-song set. CD 2 & 3  Live At The Marquee, 30 December, 1982 (mixed in 2007 at Abbey Road from the original multi tracks). Marillion was all but The Marquee's band in residence throughout 1982. Recorded by Nick Tauber for EMI, but only mixed down last year, this is the band's final concert at the famous venue as Marillion, though the band was later to play secret gigs there under different names for their fan club. As Fish announces during the gig, the band had simply outgrown The Marquee with hundreds of fans locked out. For Fish, the next stop  to accommodate everybody  had to be Hammersmith Odeon. The gig features the just-written Script For A Jester's Tear and the lengthy fan favourite Grendel as highlights. CD 2 Live At The Marquee 30 December, 1982 (Part 1). CD 3 Live At The Marquee 30 December, 1982 (Part 2). CD 4 Live At The Reading Festival 27 August, 1983 (BBC radio recording). By now Marillion was quite simply one of the biggest live bands in Europe. Recorded for BBC Radio 1, they blew headliners Black Sabbath off the stage at 83's Reading Festival. A performance that has gone down in Marillion legend, the set relies heavily on debut album Script For A Jester's Tear but features Assassing from the following year's album Fugazi. Also featured are the band's last performances of firm fan favourite Grendel and the closing Market Square Heroes, featuring a segment of David Bowie's The Jean Genie. CD 5 Live At Hammersmith Odeon 14 December, 1984 (BBC radio recording). Recorded by BBC Radio 1 (and also broadcast in the US on syndication by Westwood One) on the band's pre-Christmas Fugazi tour the set, as well as featuring many favourites from the band's first two albums, is noted for the performance of what would become Side 1 of their biggest selling and most famous opus  Misplaced Childhood. Clearly the project is still a work in progress as heard by the different lyrics and vocal melody of Kayleigh compared to the version that became the huge hit single. CD 6 Live At Wembley Arena 5 November, 1987 (BBC radio recording). A charity concert in aid of muscular dystrophy and attended by His Royal Highness Prince Edward, this concert saw the band on a live and commercial high. Having stormed the album charts all over the world with Misplaced Childhood and, more recently, Clutching At Straws, the band could do no wrong. Featuring both old live favourites such as Assassing and Incubus from Fugazi, the reworked Misplaced Childhood Side 1  now more closely resembling the album  and a huge chunk of Clutching At Straws, this sees Marillion a long way from those heady days in The Marquee. Due to time constraints and legal issues, the encores of this BBC Radio 1 recorded concert  The Boys Are Back In Town, All The Young Dudes, Gimme Some Lovin' and With A Little Help From My Friends, and featuring Iron Maiden's Bruce Dickinson, Janick Gers and Nicko McBrain  have had to be omitted.  On October 20 (2008), Marillion released their new album Happiness Is The Road, exclusively through the band's website marillion.com. The album is already receiving rave reviews and the media coverage of their innovative use of peer-to-peer sites to market the album has been phenomenal.  Fish left Marillion in 1988 and went on to forge an impressive solo career. The band, with new vocalist Steve Hogarth, continued to thrill their ever-growing fan base. On 6 October (2008), Fish released his second single from the album 13th Star, entitled Zoe 25. The single was inspired by Page 3 Girl Zoe McConnell, and looks set to take over from the classic Kayleigh as the rock front-man's biggest hit single to date. The album and single can be found at his official website the-company.com.